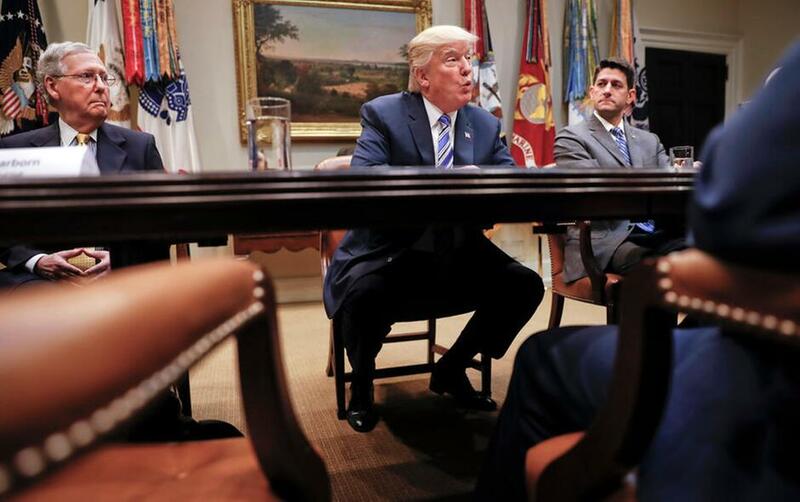 President Donald Trump, flanked by Senate Majority Leader Mitch McConnell of Ky., left, and House Speaker Paul Ryan of Wis., speaks in the Roosevelt Room of the White House in Washington. President Donald Trump resumed his taunts of his party's Senate leader, expressing disbelief that McConnell couldn't persuade a Republican majority to pass a health care bill. WASHINGTON (AP, AUGUST 10, 2017) — President Donald Trump resumed his taunts of the Senate's top Republican on Thursday, expressing disbelief that Majority Leader Mitch McConnell couldn't persuade a GOP majority to pass a health care bill. "Can you believe that Mitch McConnell, who has screamed Repeal & Replace for 7 years, couldn't get it done. Must Repeal & Replace ObamaCare!" Trump tweeted Thursday. The president bristled this week after McConnell, R-Ky., told an audience in his home state that Trump had "not been in this line of work before" and had "excessive expectations about how quickly things happen in the democratic process." Both before and after taking office, Trump spoke often about passing the massive health care overhaul quickly. "Obviously, there's some frustration," White House spokeswoman Sarah Huckabee Sanders said of Trump's tweets. She said the two men spoke by phone Wednesday and that the conversation included talk of health care. Sanders said she didn't know how long they talked. Asked to respond to Trump's statement, McConnell spokesman David Popp said, "The leader has spoken repeatedly about the path forward regarding Obamacare repeal and replace on the Senate floor, at media availabilities and in Kentucky." The Senate rejected three attempts by McConnell last month to approve legislation annulling and rewriting much of President Barack Obama's 2010 health care law. Nursing a 52-48 majority, McConnell needed support from 50 GOP senators to prevail because of unanimous Democratic opposition, but there were enough Republican "no" votes on each tally to sink the effort. Vice President Mike Pence would have broken cast a tie-breaking vote. McConnell spelled out his view of the path forward in his Monday remarks to the Rotary Club in Florence, Kentucky. "If people can show me 50 votes for anything that would make progress on that, I'll turn back to it. But in the absence of that, we're going to be moving on. We have a number of things to do in September," he said. McConnell cited must-pass bills that would prevent a government shutdown and a federal default, plus a GOP desire to turn to tax cuts. But he also kept the door open for a narrower health care effort aimed at stabilizing individual health insurance marketplaces around the country. "I think no action is probably not going to work, because you've got a lot of private health insurance markets imploding," McConnell said. "So exactly what form that takes is unclear right now." A small handful of online exchanges created by Obama's law may have no insurers offering coverage next year, but many may have just one company selling policies. Many insurers around the country are proposing to raise premiums, often citing worries that the Trump administration will take steps to undermine the markets, such as halting federal subsidies they receive to lower costs for millions of people. In Trump's shot at McConnell on Wednesday, he wrote on Twitter, "Senator Mitch McConnell said I had 'excessive expectations,' but I don't think so. After 7 years of hearing Repeal & Replace, why not done?" AP reporter Jonathan Lemire in Bridgewater, New Jersey, contributed to this report.